Last November, I spoke to a group of Advance Master Gardeners at the Tolland County Extension Center about design compositions for container gardens and how to achieve growth success. My session was broken up into 5 modules, which was certainly more than enough to cover two hours of talking, and it included information such as how to carry the elements of design learned with container gardening to small gardens, and methods to extend the growing season by utilizing sound gardening principles, as well as my own “5 Must-Do’s” for growth success in container gardens. To begin my lecture, I wanted to share a story. The idea being, by sharing my story of a container garden installation I did for a wedding client over the summer, I could explain how many factors came into play to meet the bride’s requests. 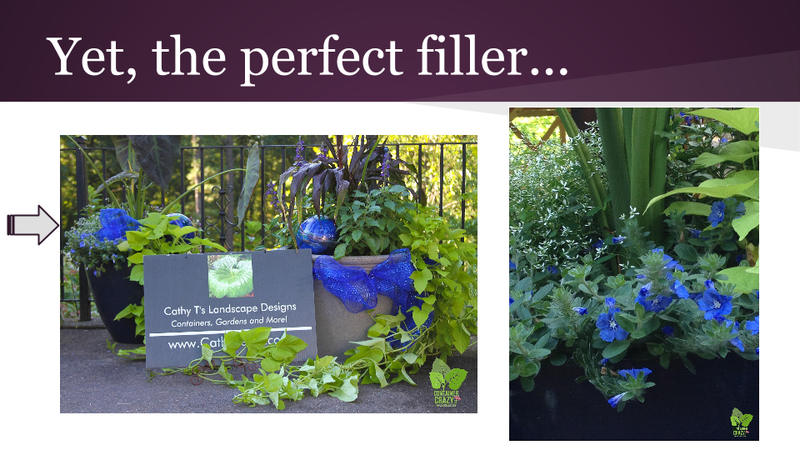 My goal was to discuss the different elements required to meet a client’s needs in the container gardening world, such as plant knowledge, plant care, experience with various plants, and of course inspiration – for one requires inspiration most of all to succeed. Without inspiration, I told the audience, there is no passion behind your work and design compositions. 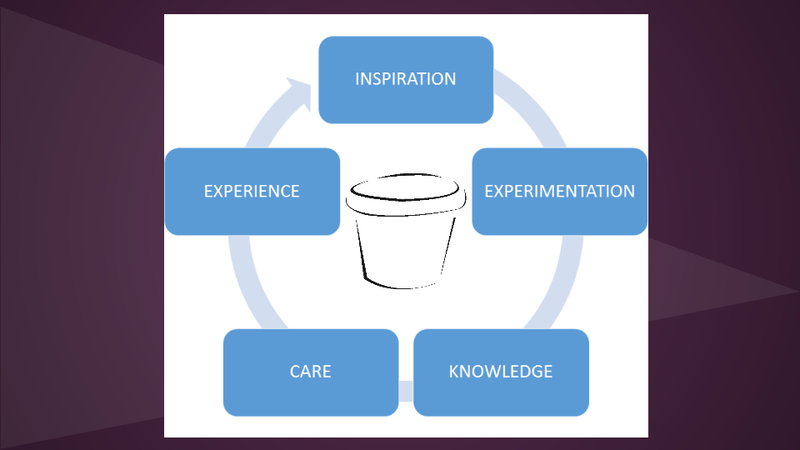 And, I also added the element of “experimentation.” This is certainly needed and gained over time. In the plant world, no matter which field you decide to work in, experimentation is an important element. So, my story of assembling, caring for, and eventually delivering container gardens for my new bride client over the summer continued. One of the first things the bride told me was her color theme when we discussed her desire to dress up her planned outdoor space with container gardens for their wedding celebration. Color is of utmost importance for all weddings, but when she told me her three bloom color choices included cobalt blue, a little ping of concern went off in my head. 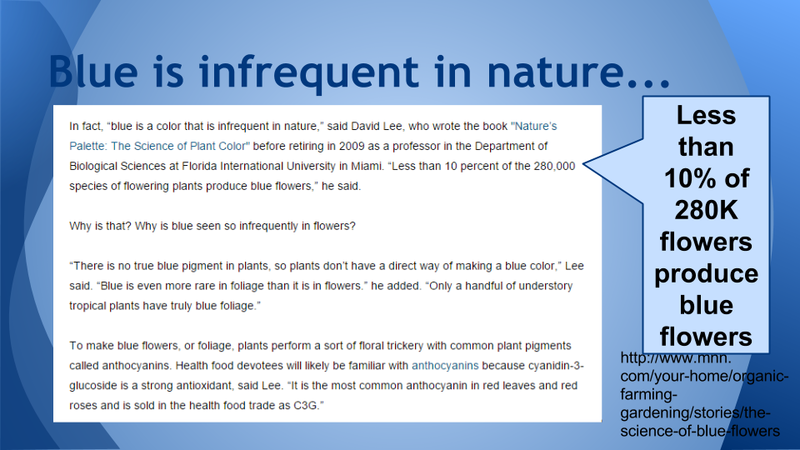 I was immediately concerned with this particular flower color because blue, in general, is uncommon in nature. Thus, I began to explain this to the bride, but also assured her we could incorporate some garden art and mesh ribbon to provide the punch of cobalt blue, as well as seek out cobalt blue pots. The bride was very understanding of the blue flower color dilemma when I explained to her plants in container gardens are unlike plants used for floral design. Floral design flowers are harvested, cut and stored in refrigerated facilities to be kept perfect up to the day of assembly. Plants in container gardens are living, ever-changing, and would require care and attention up to her wedding celebration date which was the very end of August – just another factor to consider, for the weather in August in Connecticut could be hot and humid. But as I said, the bride was very understanding and wished to proceed – and so did I for I certainly had the element of “inspiration” in my spirits and was extremely excited as well as honored to be hired to do the job of installing container gardens for her special upcoming event. 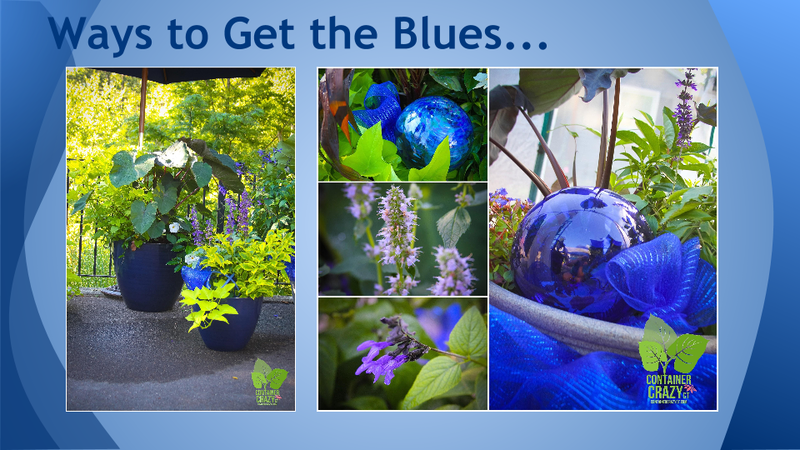 Having plant knowledge enabled me to easily decide on several blue toned flowering plants to use, as well as her other color choices, which were lime green and white. I spotted it at a local garden center. 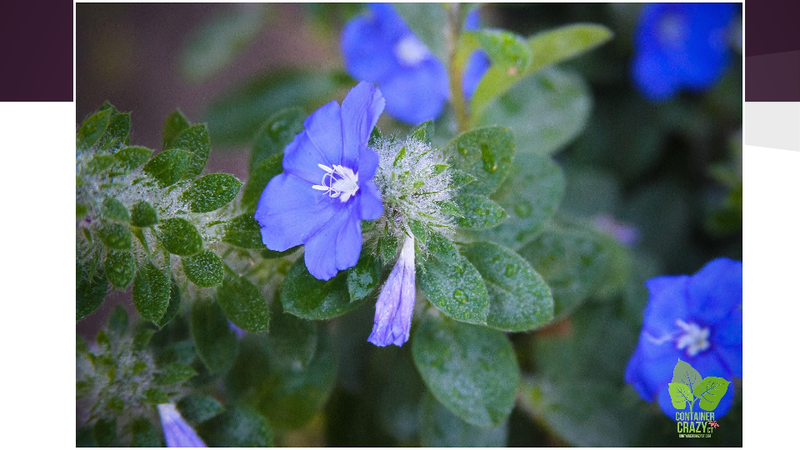 Its low-habit, pretty blue petals with white centers, and the fact it was noted to bloom from June to frost, made it a perfect candidate for my goals. When asking a very young sales lady what she thought of this plant, she assured me it would bloom all throughout summer – which was of key, and one of the attributes I was looking for in this project’s plant candidates, because the wedding outdoor celebration was to be held on the very last day of the month in August. So, although I knew very little about this plant, an annual in our Connecticut planting zones, I decided to take a few starter pots of them to get them growing into larger specimens over the summer months, and take a leap of faith that this new plant to me, Evolvulus glomeratus, would be a good performer for my purposes as a filler in the container gardens. On top of not knowing much about the plant, it did not have a plant tag in its pots when I purchased them, but ironically, a friend planted one in her yard and I noticed it when visiting her – so she let me take a photo of her plant tags that day. 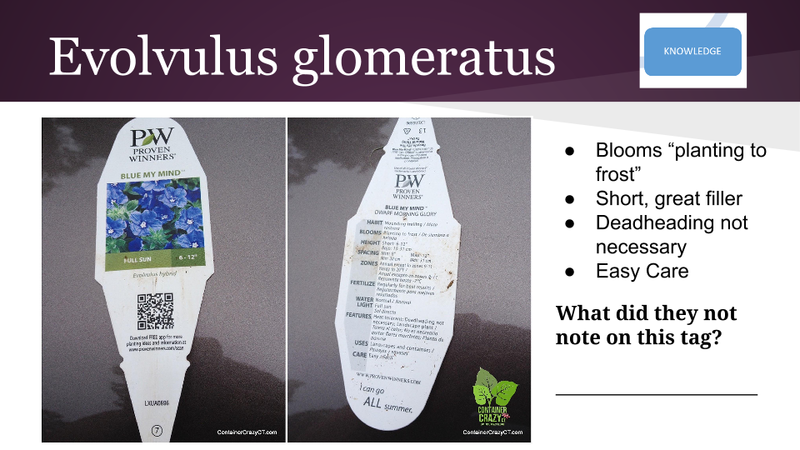 I always say, plant tags don’t come with warning labels, and there was something missing on this tag which affected my plans. Everything listed, such as “blooming til frost, no deadheading necessary, and easy care” fit the bill for my needs to meet the client’s expectations, but it had a habit which surprised me one day, as I browsed my stock to check for any insect problems or concerns. Imagine my surprise when one afternoon I discovered the flowers were rolled up as tight as tiny cigars! 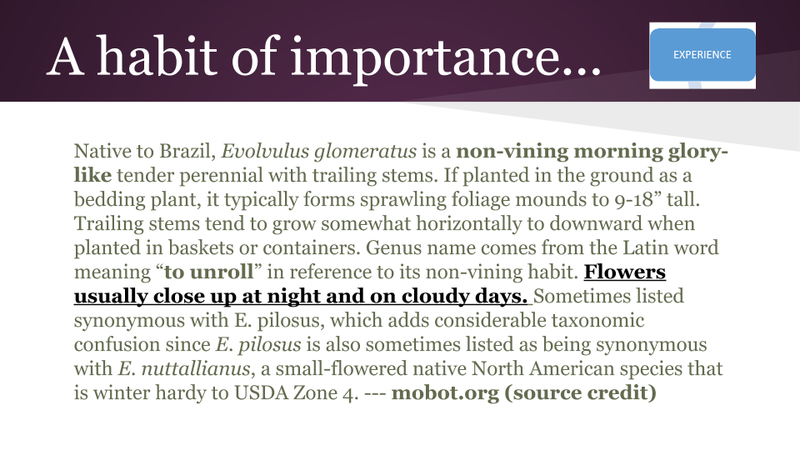 Upon researching it via the Missouri Botanical Garden’s Plant Finder website, a site I mentioned to the Advance Master Gardeners as a very useful resource for plant research, I saw it noted in black and white – Flowers usually close up at night and on cloudy days. The moral of my story, that day as I spoke to the Advance Master Gardener group, is there are so many considerations required when putting container gardens together for client installations. I needed the plants to be long lasting, tough, have a bloom period at the end of the season, be resistant to insects or other plant related problems, and serve the correct role in my container gardens (thrilller, spiller, filler) for this special client. The “elements” spoken of earlier all came into play. When I realized the flowers on this plant with blue blooms had the potential to close up on cloudy days or at night (and the wedding start time was late afternoon), I had to make a decision. And, my decision was to proceed with using them regardless. Risking the blooms rolling up would be something I would have to take. After all, there were many other reliable plants in the container gardens which met the bride’s color choices based on my knowledge of the plants. I knew the other plants used based on her other two flower color choices of lime green and white, along with other blue flower plants, would perform well. The show must go on – and Evolvulus glomeratus (noted as a non-vining morning glory like tender perennial, or referred to as “me-me’s” by the young lady at the nursery where I picked them up) ended up being the perfect filler. After venting about it on Instagram, I proceed with my project of caring for all the plants until assembly and delivery time. After all the fretting, planning, caring, and obsessing, it was all worth it because I will never forget the reactions of the bride, groom, and mother of the groom, when I opened up my trailer filled with lush container gardens for their event. It was just like being on a reveal show. Their reactions being so positive, I felt I achieved my goals as best as I possibly could considering all the elements required to get the job done. 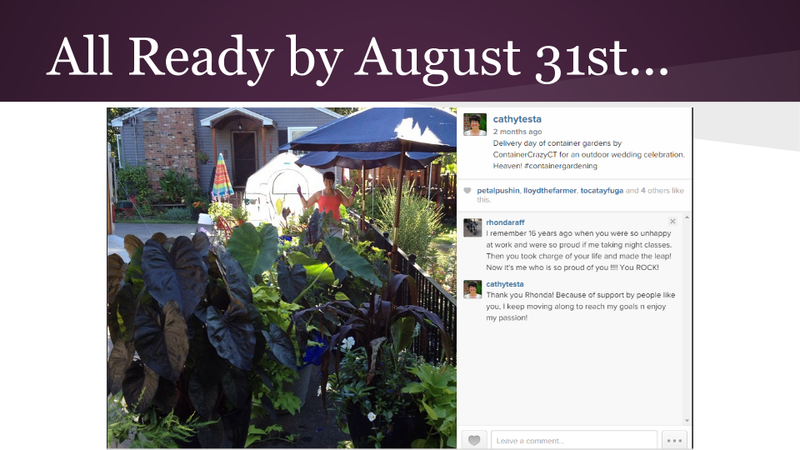 To learn more about Cathy Testa’s Container Garden Rental Services, see the menu bars above or click here. 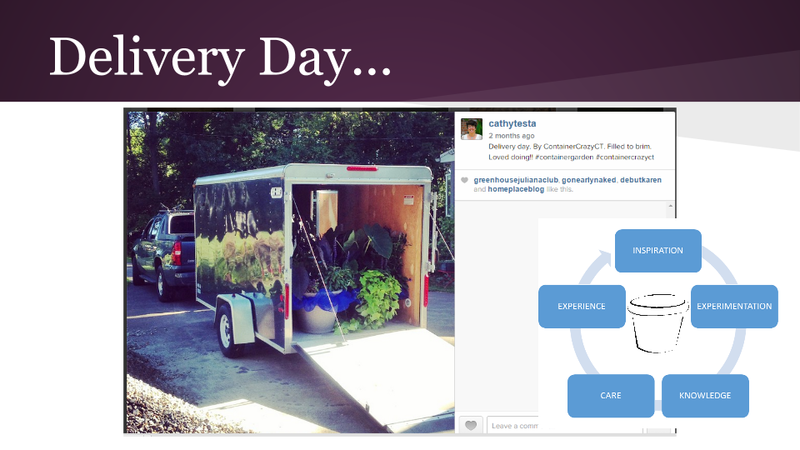 Cathy T’s next speaking engagement is at the Farmington Garden Club on Monday, February 9th, at 11:30 am. Location: Farmington Main Library, 6 Montieth Drive, Farmington, CT. Topic: Incorporating Decorative Edibles in Mixed Container Gardens and Cathy T’s “5-Must Do’s for Growth Success”, along with Trending Talks. 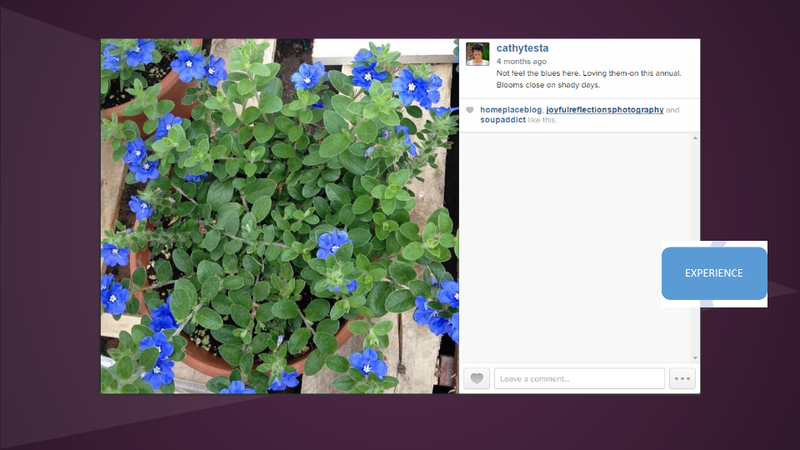 Check back in to learn more about the other plants used in this design – They will be shared on this blog! Great post – and so glad the “happy couple” were appreciative of your display. An important lesson, Cathy. Thanks for sharing it with us. Everything turned out great despite your experimenting with an unfamiliar plant. The containers looked great. I have done two weddings and had some of the issues you mentioned. Timing is everything.